Our greatest wish this year is that we continue to enhance the lives of the individuals we serve. We plan to continue to grow and improve in every way. This growth comes from planning within our organization and help from our surrounding community. Help that comes from supporters like you. Thank you for all you have contributed to RISE! We have recently prepared an updated Wish List for 2019. This list helped our organization greatly in 2018 and many wishes were granted. This Wish List is linked for download and viewing below. There are items for our Northville Sensory Gardens, various residences and even professional development. We hope you will share and consider being a part of granting one of these wishes this coming year. 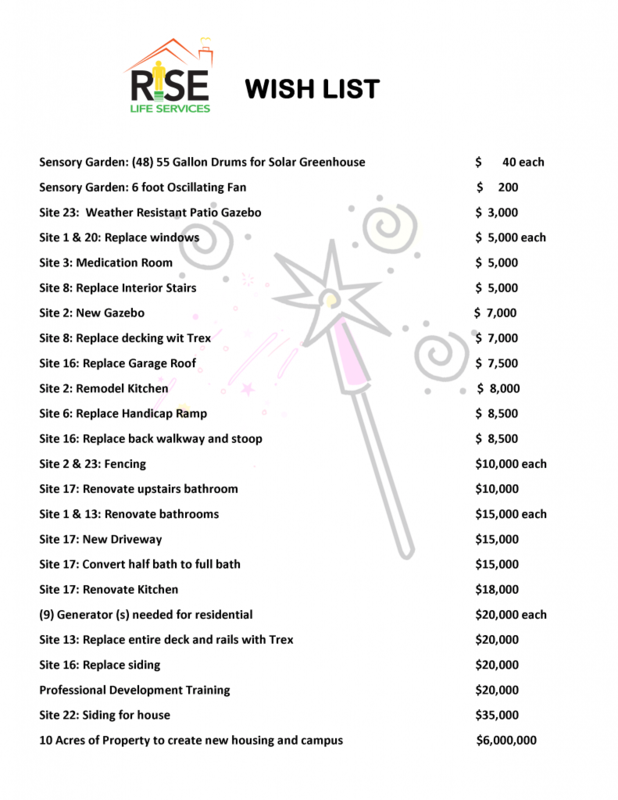 Click here to view a PDF of our 2019 Wish List.